The running culture has really caught up in Namma Bengaluru. What I love about it is how it keeps growing unlike one of the many fitness trends to hit the city. The reason we Bangaloreans readily adopted this format of exercise is because of the great weather. Yes, summer's can be bad, but we have beautiful parks across the city to retreat to if you’re not keen on hitting the streets. If you haven’t tried running yet, here are the best outdoor running spots in Bangalore that will get you hooked. Practically the Central Park of Bangalore, this spot of greenery transports you to a different era. The best part about the park is that it’s a no traffic zone until 8 am on weekdays with no traffic all day on Sundays allowing you to do tons of stuff beyond just running. For runners though, it gives you both trail and road route running options. If you touch all the exit gates of the park, you can do a good 5km circuit. You can also make your own route for your longer endurance runs. My favourite thing about this park is its vibrant energy. From art installations to heritage buildings, to elderly gentlemen and gossipy housewives, and to dog parks and laughter clubs – you can see it all happen on any given morning! Pro-Tip: Perfect for long runs. 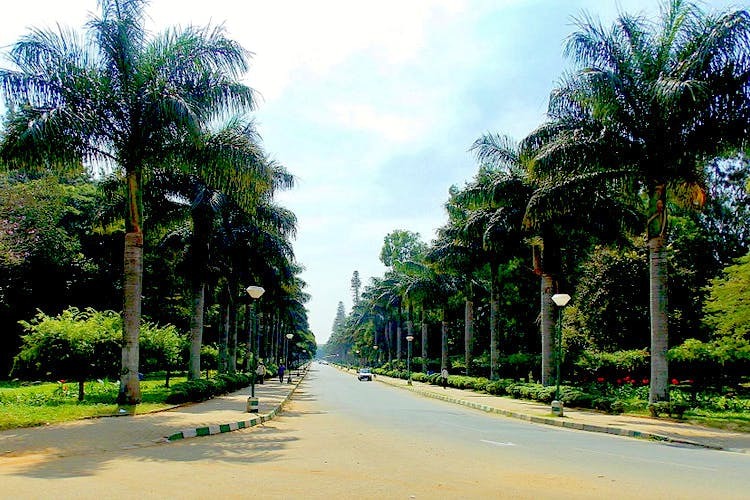 Located in the South of Bangalore, Lalbagh is the city’s botanical treasure. This park is a real treat for the eyes with flora dating back centuries. Lalbagh is famous for its exotic flower show which is held twice a year. And for joggers, it’s pure heaven! It has two glass houses, a lake, rocky surfaces for uphill runs and a dedicated path just for runners. You can easily do a 5km loop around the park. Pro-Tip: Morning and evening runs are both great here. Timings: 6 am to 9 am and 6 pm to 7 pm is free for runners and fitness enthusiasts. Wrapped around the Central Business District of the city, Ulsoor Lake is spread over 3 km with a 1.5 run track that offers a great view. There is a fitness circuit created in a small patch of the garden along the trail where you can do strengthening exercises and stretches. And you’ll be surprised how beautiful it is despite being right in the business area. In fact, it leaves you feeling like you’re far away from the hustle and bustle of the city. You can take a boat ride to cool off after your run or take rowing lessons if you feel adventurous. Pro-Tip: Great for tempo runs and shorter distances. Make sure you catch a sunset run. A pretty popular landmark in Bangalore, it might just be the biggest sports hub in the city and The Fortress of Bengaluru FC, it has plenty of events happening all the time. But a little known fact is that it has a brilliant run track of 400m that is up for grabs in the wee hours of the morning. You can do your sprints and high intensity runs here. Breaking your speed limits when you train on this track with the stadium surrounding you, makes you feel like a real winner! Pro-Tip: Early at daybreak is really gorgeous, go at 5 am for some magical misty Bangalore mornings. Agara Lake in HSR Layout is a beautiful and one of the many resorted lakes in Bangalore that is a spot for fresh air and getting fit. The cycling and jogging track goes all around the lake is about three to four kilometres, so you will get that solid cardio session in one or two laps. Plus, there's a mini outdoor gym to stretch those muscles too. An 85-acre park with three lakes and a musical fountain, JP Park in Mathikere is a gorgeous spot that will probably have you ditching the other parks and spaces on this list. The park boasts of a 4.5-kilometre jogging track that takes you through the park’s lush environs which include over 250 plant species. You might catch many Jayanagar Jaguars (no no, they are not actual jaguars, but Bangalore's oldest running group) at this spot! Pro-Tip: Perfect to kick start your marathon training! This park is Koramangala's spot of green. It's got a jogging track that goes all around, an outdoor gym, a kid's play area, and plenty of space for you to sit down and enjoy some of that fresh air. While residents from all around take up the jogging space post 7: 30 am and 5 pm on words, you still can go Mo Farah here. You will love that there's so much of greenery. Almost every inch of the park has a green cover of bushes, flowers, and trees. With inputs from Sreepathy Paliath.